"I love my new Alberto Fasciani boots--they are the most comfortable and beautiful boots I've ever ridden in!" February 3, 2018, AGDF, Wellington Florida. "I want to thank Hayward Sportswear for sending me short sleeve show shirts at the last minute down here in Wellington! It finally turned hot! Hayward supplies my show jackets, they custom made my jacket for Anton so I can Velcro the tails to my Ecogold saddle pads. Anton hates the tails touching him! Hayward also has beautiful stock ties. Thanks Rhonda for all your support and wonderful show clothes!" March 7, 2016; Adequan Global Dressage Festival. "Thank you to Omega Alpha who continue to supply me with their incredible line of products. The Gastro fx was my friend this past weekend! Palgrave can be a very busy show and the gastro fx settles my horses stomach." June 9, 2014, WEG qualifying. "After traveling back from Florida, one of my young horses was out of sorts. He was girthy and more nervous than usual. I suspected he might have developed an ulcer from the trip, so I put him on Regenerq, from Omega Alpha and less than 10 days later he is completely back to his usual happy self. A great product!" May 2, 2014. 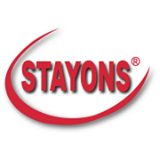 "Using STAYONS as preventative care keeps my 15-year-old horse in top condition. Anton feels like he is in the best shape of his life. STAYONS wraps are so simple to work with and are extremely easy to pack for horse shows. You simply soak the STAYONS wrap with cold water for 30 seconds and apply it directly on the leg with a stable wrap. The best part is that there is no mess. Anton has definitely benefited from this therapy -- and we have too, as they’re so clean and easy to use!" July 2015; Pan Am Games. "Thank you to EcoGold for the beautiful saddle pads! My horses love the quality and their backs feel great!" October 8, 2015; Dressage at Devon.